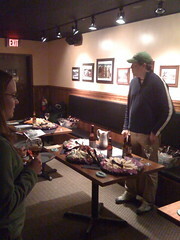 Capital Ale House in Fredericksburg held a Dogfish Head Beer & Cheese Tasting Wednesday evening. Devin Arloski of Dogfish Head Brewery, and Jacab Brunow, Director of Beverage Operations for Capital Ale House, were the hosts for the evening. Five Dogfish Head beers were paired with 5 cheeses. During the hour long tasting, Devin shared details about the beers and their history, along with many interesting tidbits about Dogfish Head Brewery. About twelve folks attended the informative tasting. This is the second beer and cheese event at the Fredericksburg Capital Ale House. The events are not highly publicized, yet. Jacob tells me they want to be sure they have everything running smoothly before more widely publicizing them. Similar events at the Midlothian location can draw 50 or people. Of course, there is something to be said for the intimacy of the smaller audience. Jacob says there are many more beer events in the works for the Fredericksburg location. Watch the Capital Ale House events page and this blog for more information as it becomes available. A few pictures from the Dogfish Head Beer & Cheese Tasting here.